David Tang. Photo: Victoria Birkinshaw. THE LANDLINE TELEPHONE was still a rare commodity and the mobile a mythological status symbol in 1991 Beijing. After a banquet dinner at the Diaoyutai State Guesthouse (Beijing’s social citadel of high-level power brokers), David Tang wanted to surprise his English friends—come to see the mysteries of China shortly after the political brinksmanship of 1989—with a late-night art show. In the dark, our bevy of limousines circled the old city, trying to find the ancient gate tower where an unofficial exhibition was kept open for us. We lost contact with our guide, artist Yang Yiping of the pioneering Stars Group, and everyone eventually gave up the chase. Everyone, that is, except David and me. This was the first time David came with me to China. Eventually, he reinterpreted the magic of that evening’s discovery for his international friends—using his own inimitable creativity and sense of fun—when he designed the China Club, which opened in Hong Kong in September 1991. His translation of our wonder at witnessing the dawn of a new cultural era was perfect. The China Club of the 1990s was the epicenter of international diplomats and politicians, jet-setters and business tycoons, all converging in Hong Kong to experience, close-up, the incredible transformation of China that was taking the world by surprise. 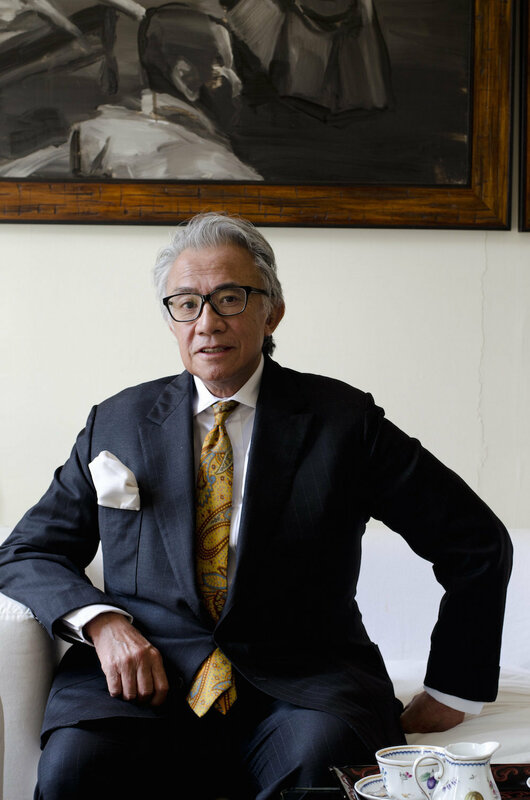 The years leading up to the Hong Kong handover in 1997 were particularly exhilarating, and David, being the larger-than-life figure that he was, built the ideal stage on which the country’s metamorphosis could be displayed. He had impeccable taste, tinged with a twist of naughtiness. He picked a Zeng Fanzhi portrait for the similarity of its subject’s pose to that of one adopted by Prince Charles, and when Princess Diana eventually visited the club, David amused himself by nudging her to ask, “Guess who?” He tried to commission Yu Youhan, the pop painter of Chairman Mao images, to make one of nationalist Generalissimo Chiang Kai-shek, to complete his gallery of Chinese leaders. But Yu was intimidated by the political ramifications of making such an image and instead produced one of Dr. Sun Yat-sen, the father of the republic and a figure recognized by both the nationalists and the Communists. David was a true connoisseur, not bound by any conventions. No other collector at the time would have lined the foyer and stairwell of his club with beaux-arts-style oil paintings by Chinese academic artists when it was the Pop- and Cynical Rogue–style paintings he installed upstairs that were in vogue. But he had the correct intuition: All these artists, despite their various approaches, were contemporaries at the academies, and by bringing together their opposed works, he gave a full picture of China’s art scene. Likewise prescient was his pioneering display at his Long March Bar of art from the Cultural Revolution. It was a bold visual proclamation of the era that created China’s most radical cultural change. David was not only passionate about art; he personally engaged with artists he liked. Taiwanese sculptor Ju Ming’s first European exhibition, inaugurating the Queen’s Walk at South Bank Center in November 1991, was a show David made possible by bending the ears of Sir Ronnie Grierson, chairman of South Bank Center at the time, and charming financial backing out of our old friend T. T. Tsui. But no feat was as memorable to me as his support for my curatorial engagement with the 1995 Venice Biennale, the year Gérard Régnier was artistic director. Artists Zhang Xiaogang and Liu Wei were included in the centenary exhibition, the first moment Chinese artists broke into such a significant historical event in the West, and David, with his natural generosity and schoolboy’s sense of fun, suggested we stage something dramatic. He managed to persuade Diana to come to Venice as our special guest, to honor the Chinese artists. Everything went as planned until Diana’s publicity manager previewed the show and was alarmed by the explicit sexuality in Liu’s work. He feared a photograph of her with the paintings might cause a scandal. So David, with his usual quick thinking, revised Diana’s path so that she narrowly avoided Liu’s paintings. David’s generosity was legendary. It was a natural expression of his love of friends as well as his sense of noblesse oblige. The charities he supported were legion, many inspired by the pain he saw in people close to him. His dedication to fighting Down syndrome, for example, was motivated by the plight of the son of his driver. If there is anything David could be faulted for, it would be his excessive concern with his friends’ well-being. When Hazel and I got married and traveled to London and Venice for our honeymoon, David was so enthusiastic that he not only threw jolly parties for us but also insisted on joining for the Venice leg of our trip, showing a camaraderie that was much appreciated even though it made for an unusual nuptial celebration. Remembering David is painful at this time, when one wishes he were still here. But he is still very much alive for those who were drawn into his universe, and each is comforted by memories of personal engagement and adventure. But surely no memories have been as well articulated as those David himself penned. A true cosmopolitan and classic literatus, David was never short of a well-turned phrase to give shape to an unorthodox insight. If he had lived to a ripe old age and composed a memoir, it would unquestionably have been a most delightful, enviable tome. Alas, perhaps this would have been too conventional a literary form to expect of David: He loved living in the moment, and his expression of these fleeting experiences through voluminous correspondences and regular published columns defy the classic form of a monograph, which presupposes closure. David was the genius of the open book. Johnson Chang is the founder and director of Hanart TZ Gallery in Hong Kong.